First of all, I’d like to start off by saying thank you for a great product. It’s long past due to you at Sportsmen Condo. I purchased two of your original four foot round condos. You gave me a great deal because I ordered two.I bought them in either 2006 or 2007. I have a great memory, but it’s getting shorter the older I get. Both of them are withstanding the harsh Wisconsin winters and look just as good as the day we bought them. 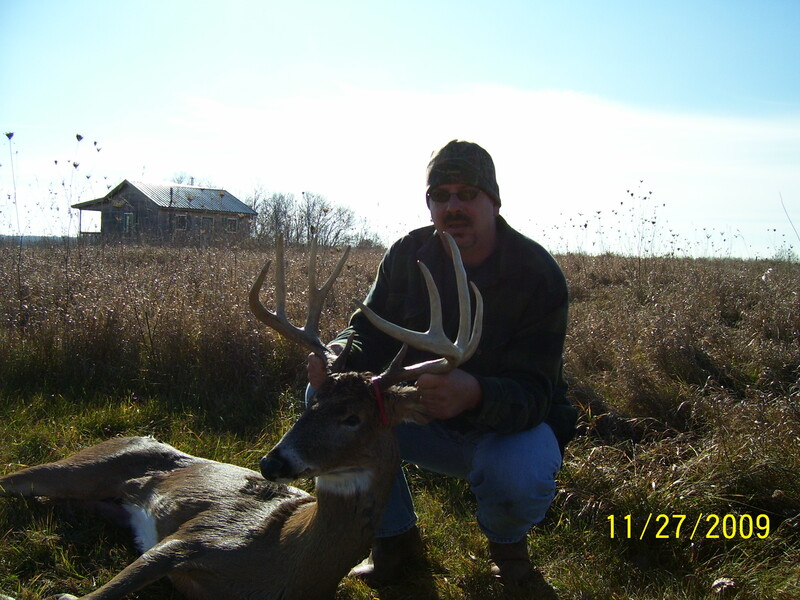 I’m sending a picture of a deer that I shot in 2009 that I have to give Sportsmen Condo complete and full credit, no if’s and’s or but’s about it. It was a Wednesday in November during Wisconsin gun deer season, the fifth day of the hunt. It was unseasonably warm that day. It was raining buckets that morning, with thirty mile per hour winds. I was really questioning what the heck I was even doing hunting in that weather. I was toasty warm and dry in my condo though. It was 9:30 and I had enough. As I was ready to leave my condo, I looked behind me, directly downwind of me, and there was a 150 inch ten pointer. The rest is history and a great memory. I truly believe I owe Sportsmen Condo that memory. Now the future purchase. I’m definitely getting a Crossbow Condo this spring.